The A8 has been the pinnacle of the Audi range since the first generation version appeared in 1994 and has always brought the most sophisticated technology and the greatest comfort that the brand has to offer. 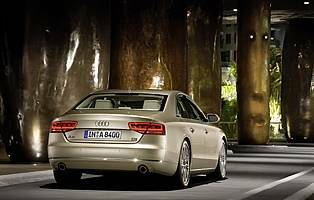 Now the A8 has reached its third generation, and the competition in the executive saloon segment is fiercer than ever. The principles of the A8 remain the same for this third generation car. The exterior styling is recognisably an evolution of the outgoing car, although it does also bring several styling cues from elsewhere in the range, in particular the A5 coupe. Although more conservative than two of its key rivals, the A8 is undeniably handsome and well-executed, with some impressive details. It also manages to look smaller than its dimensions would suggest, which is not easy to achieve. Another continuing key element to the A8's appeal is the use of an aluminium spaceframe chassis. Although a complex undertaking for the manufacturer, Audi claims that it saves 200kg over an equivalent steel chassis whilst matching its rigidity and crash performance. That brings significant benefits to fuel economy and performance by making the most out of the available engine performance. Mechanically the A8 has air-suspension on all models, plus the Audi drive select system, which gives the driver the opportunity to tailor the car to suit the driving conditions. The engine range has also been updated, with either revised or new units - a mix of three diesels and one petrol is available. All A8s also feature a new eight-speed automatic transmission, which promises smoother shifting and improved fuel economy. One final area where the A8 has received much attention is in terms of on-board technology. 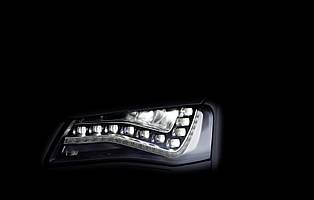 It is available with full LED headlights, a night vision camera and massage seats amongst other equipment. Two of the main highlights are the introduction of a touch-pad to the MMI interface, which allows the drivers to spell out a destination or phone book contact for greater ease of use, and also the advanced satellite navigation, which utilises the Google search engine as well as 'reading' the road ahead and sending information about it to the gearbox to ensure the best gear selection. Nothing less than excellent would do for the A8, and the finished product more than lives up to that target. 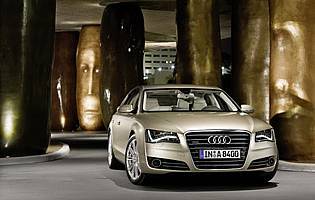 More attractive inside and out, faster, more efficient and more comfortable, the new A8 also manages to be more fun to drive, almost the only criticism that could have been levelled at the old car.